Star polyps are soft corals. They have a height of one-half to one inches, and a adult head size of one-fouth to one-half inches. Star polyps are commonly seen in the colors of green and pink. Star polyps are colonial corals, meaning that as the coral grows, it will expand itself further while staying connected. Star polyps are easy to take care of as they can tolerate changes in water parameters well. 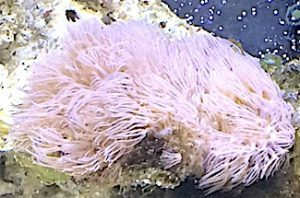 Star polyps will retract into their purple mat for a while when there is a change in salinity, pH, or temperature, but they will soon pop back out again after they adapt to the change. Star polyps are known as “wildfire” coral, because under the right conditions they will grow rapidly fast. Star polyps will grow all over your tank: on rocks, on substrate, on the glass walls. Growing fast is a good thing to decorate your tank. However, you will eventually need to keep your eye on them to keep from from turning “invasive” in your fish tank if you do not want them everywhere. Star polyps are to be placed in the middle or the top of your aquarium. They require medium to high lighting to be happy and come fully out of their mat. Star polyps also should be high so that they get a large amount of water flow blowing them. Water flow is needed to keep star polyps content because water flow keeps their purple mat free of debris. If needed, you can pull algae off your star polyp’s mat, or gently clean it with a toothbrush. When their mat is clean, they are happy. Star polyps contain plant-like organisms called zooxanthellae within their bodies. Zooxanthellae allows the star polyps to get their nutrients from the photosynthetic process. You do not need to feed algae or meat to your star polyps. However, if you feed your aquarium algae occasionally, it will certainly not harm your star polyps. Star polyps are great natural indicators for your tank water. If your star polyps are growing slower than usual, there is something wrong in your water parameters. When this happens, I advise you to check the pH, alkalinity, salinity, iodine and calcium in your tank as these are common causes of slow coral growth. Low calcium espeically causes slow growth because calcium is needed to make more skeleton for the star polyp to expand. Make sure your pH is 8.1-8.4, alkalinity is dKH 7-12, salinity is 1.023-1.025 sg, and your calcium is approximately 400 ppm. If these elements are in check, make sure your nitrate level is below .2 ppm, and your phosphate level is below .05 ppm, and your ammonia level is 0 ppm. As with all corals, new salt must be added to your tank because it contains trace elements that are vital to coral health and growth. Star polyps are a very peaceful coral. They will no bother fish or other corals. However, you should be careful when pairing star polyps with corals that can sting or be aggressive. Star polyps are easily damaged and they can start losing heads when exposed to the toxins of aggressive corals. If you have aggressive inhabitants in your aquarium such as hammer corals or anemones, you should keep them a fair distance away from your star polyps to ensure peace and safety. Star polyps are one of the easiest corals to grow and propagate. Naturally, star polyps will grow quickly and spread in colonies under ideal water conditions. However, if you wish to divide the coral to have many separate pieces growing at once, you may also do so easily. To propagate star polyps, use a sharp object such as a razor blade or X-Acto knife. You will be taking your star polyp out of your aquarium for a few minutes, which is okay for the coral. Push the blade between the rock and the coral carefully, until the purple mat is off the rock slightly. Now peel a section of the purple mat off the rock using your fingers. Cut a section of the purple mat off. The last thing to do is to use reef-safe glue to fasten the section of purple mat to a new rock. After approximately a week of de-stressing, your star polyps should pop back out and extend once again. This entry was posted in Corals on June 24, 2018 by Joshua@themandaringarden.